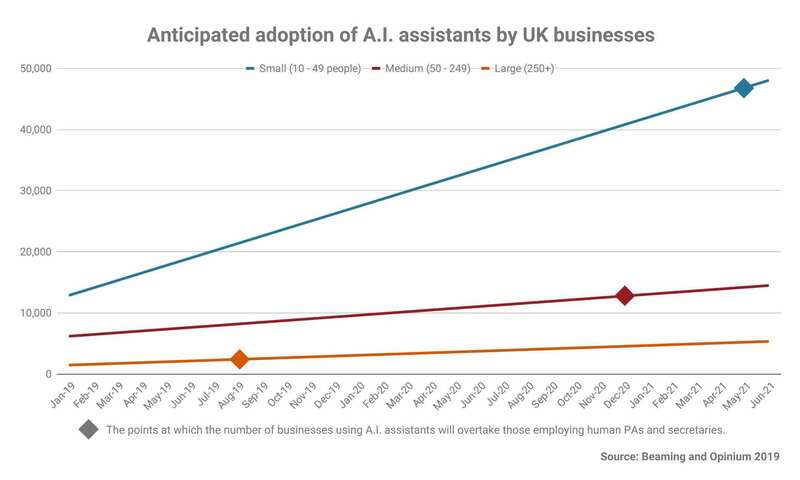 The number of big British businesses using Artificial Intelligence (AI) powered assistants will overtake those employing people as personal assistants (PAs) and secretaries for the first time during 2019, according to our new research. Beaming’s study, which was conducted by researchers at Opinium, reveals that the proportion of large companies using products such as Alexa, Siri, Cortana and Google Assistant to help with tasks such as dictation, information gathering and calendar management is expected to more than double in 2019, rising from 18% of the large business population to 39% by the end of the year. Beaming expects the number of large companies using A.I. assistants to overtake the 32% of similarly sized businesses that employ human PAs and secretaries in August 2019. The study reveals that the use of A.I. assistants will increase among all sizes of business in 2019, expanding from 17% to 27% of medium-sized companies and from 6% to 13% of small firms. Given this current rate of adoption, Beaming predicts that the employment of A.I. assistants will overtake human PAs and secretaries in medium-sized companies by the end of 2020 and at small firms in 2021. Across all business sizes, A.I. assistants are already more common than their human counterparts in companies run by younger business leaders. Beaming’s research indicates that they will be as prevalent as PAs and secretaries in companies run by 35-54 years old leaders by the end of 2019. Beaming’s study also reveals that cybersecurity and connectivity will top the IT investment agenda for UK businesses in 2019. Almost a third (30%) of companies questioned said they would invest further in cybersecurity this year, while a quarter (26%) said that they planned to improve their connectivity. By comparing the results of its study with the Government’s business population estimates, Beaming estimates that 672,000 companies nationwide will spend more than £837 million enhancing their antivirus and anti-malware software this year, while a further 284,000 firms plan to spend £549 million on new network perimeter firewalls to control traffic entering and leaving their systems. Connectivity is a major area of focus for micro, small and medium-sized businesses in particular. More than 400,000 firms intend spending up to £1.5bn on superfast fibre broadband services that will allow them to connect to the fibre network using their existing copper telephone lines. Another 31,000 small and medium-sized businesses plan to go a step further and invest in fibre-optic leased lines to improve the speed, capacity and resilience of their connectivity. These businesses expect to spend over £1bn between them to extend the fibre network directly into their premises.